The US is already actuarially bankrupt, meaning that our unfunded liabilities are greater than our assets. Our unfunded liabilities are estimated to be about equal to our total assets at $144 Trillion. 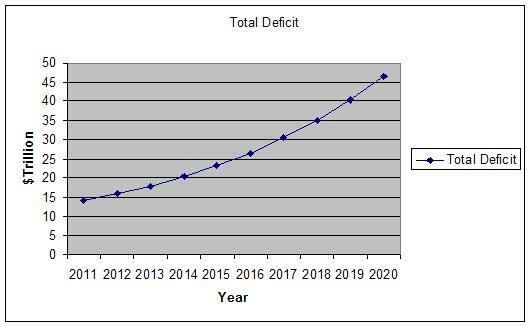 A number of people take comfort in the idea that these unfunded liabilities are not due until sometime in the future. Of course this attitude would land you in jail if you ran an insurance company, but government officials make the rules, they don’t follow them. Unfortunately or perhaps fortunately, there are some rules they cannot change such as gravity and the basic laws of economics. One of the basic laws of economics is that total consumption (worldwide) cannot exceed production plus the store of goods and services (worldwide). Governments also cannot repeal the general rule embodied in the Laffer Curve, namely there is some level of taxation at which the total revenues received by the government decreases. 7) The cost of Social Security and Medicare per recipient will grow at the rate of inflation. I believe the first assumption of inflation growing at 1% per year for the next decade with a starting level of 2% in 2011 is a very conservative estimate. Where conservative means that it errs on the side of the US not going bankrupt. The second assumption of 5000 net people per day going on Social Security and Medicare is based on the best estimates I can find. Note that there is no cost associated with Obama care in this calculation, which makes this even more conservative. The third assumption of the cost per retiree is based on the best available information I could find. The fourth assumption of the US growth rate is extremely generous. The long term growth rate of the US is 2% a year and presently it is very doubtful that US will grow at this rate this decade. 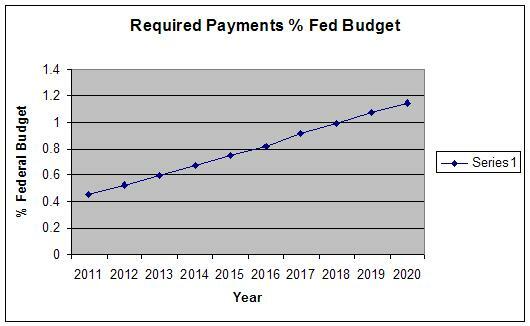 The fifth assumption that the federal debt will only grow at the rate of inflation over the next decade is almost laughable. This would mean that the debt to GDP ration would actually decline. The Tea Party Republicans wanted to cut $100 billion dollars from this years budget and they were said to be cutting it to the bone. This $100 billion is just 1/16th of the total deficit and only 1/37th of the total budget. The seventh assumption that Medicare and Social Security costs per retiree will only increase at the rate of inflation is much lower than the growth rate over the last 20 years. I’m sorry but the above post is completely unfounded by the laws of macroeconomics. For instance, you have improperly stated bankruptcy, as the US ASSETS actually number a significant amount. Many of these assets are currently not cash assets, especially in the private sector where the american GNP over GDP suggests significant wealth in foreign market shares. We usually call this dark matter in my field, but i wont get into that because you can look it up yourself and get a general idea of what it is. You also can’t predict relative inflation, because if your aware of risk projection and compensation, ud actually find the currency market is largely a random walk with large shocks. You’ve completely excluded net factor payments from your analysis, im guessing your not sure what a current accounts balance is, and the only thing i was able to gather from your analysis is if the private sector manages to repeat its 2008 collapse then yes… we could be in trouble, but otherwise your forecasting is severely projecting below the lower bound. Brhyme, Actually on an actuarial basis we already have debts that exceed our total assets including non-cash assets. You do not seem to understand what bankruptcy means. You can be either bankrupt based on your total liabilities exceeding your current assets, which the US has already clearly exceeded. The other case is that your cash outflows exceed your cash inflows. That is what this post is about. You can argue that my assumptions are unfounded, but to suggest that inflation is random shows you do not understand cause and effect. It appears to me that you do not understand macroeconomics. Dark matter has absolutely nothing to do with the financial health of the US. Physics and economics may interest, but not with respect to dark matter.